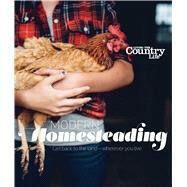 An accessible guide for the aspiring modern homesteader from the craftsmen at Living the Country Life magazine! Grow your own crops, raise backyard animals, and preserve your bounty for the winter months and beyond. Once upon a time, people had a real connection with the land. Instead of being mere consumers, they were producers and makers. Traditional skills were learned to eliminate a reliance on others, enabling the self-sufficiency that’s at the heart of the Do-It-Yourself movement. And this artisanal wisdom was passed on to family and friends. Whether you’re raising urban chickens behind your Brooklyn brownstone or feeding your family from a front-yard organic veggie plot, this book can bring a little self-sufficiency into any life.